Welcome to the first TSQL Tuesday of 2012! This month’s soiree is being hosted by Dave Howard (blog | twitter) and he’s feeling a bit nostalgic. As a result, we get to pick from any of the previous TSQL Tuesday topics and write about that. He’s even included a handy list to choose from. You can pick a topic you missed the first time around, or even one you wrote on before, you just have to write something new (no re-blogs, thank you!). They’re usually much too lofty. It’s ok to want to challenge ourselves, you don’t want to make them too easy. But using the example above, to go from not exercising at all to working out 7 days a week for an entire year? That’s asking for burnout. Few of us have the mental determination to stick with something like that. They’re not specific enough. “I’m going to work out every day.” What exactly does that mean? Run? Ok, how far? Where? Lift weights? What kind of split? Sure, you could say that any exercise is good enough. That just getting out there and doing something is the point. And that’s partially true. But you’re more inclined to stick with a goal if you have a plan. And the more specific you are with that plan, the better you’ll stick to it. They’re not measurable. This ties in with specificity. If you give yourself a quantitative goal, you’ll know when you’ve achieved it. Measurable goals give us an end to work towards, which keeps us motivated. It also gives is a great feeling when we’ve done it. So with those common gotchas in mind, I’ve decided… not to make any resolutions at all this year! Kidding! Actually I’ve decided to do things a little differently. Instead of one or two year-long resolutions, I’m going to do 12 1-month resolutions. By doing that, I’m removing the looming “Oh my gawd, I have to do this for an entire year!” sense of dread that inevitably sets in somewhere around the end of January. I only have to do each thing for a month. Anyone can do something for a month! (I hope! ) At the end of the month, I can either drop it or hopefully it becomes a habit and sticks. Either way, I’ve met my goal, so no feeling of failure. Walk Jäger every day. I am a horrible doggy mom. I don’t walk my dog nearly as often as I should. So this one is January’s resolution (actually I started in late December.) Fortunately the weather’s been relatively mild, so far. We don’t have to go far, around the block is fine. But we have to go. There’s already been a couple of days when I just did not want to. But I did it anyway, and once we were on our way, I was glad I did. Purge. I hate clutter. I love to throw things out. But even so, we’ve managed to accumulate a lot of stuff. This one should be fun. I’m using the Throw Out Fifty Things methodology for measuring this goal. Watch no TV. I don’t watch a whole lot of TV now. Not compared to the statistical average, anyway. But I want to watch less. As an ongoing process, I’m trying to be more conscious of my TV watching and only turn it on when there’s something specific on that I’m interested in. But for one month, I don’t want to watch any TV. Track our household budget weekly. We use You Need a Budget for tracking our spending. The problem is that I’m not always good about keeping it up to date. So for one month I want to keep a better eye on where our money is going. Learn Powershell. Obviously I’m not going to become a Powershell ninja in a month. But a couple months ago I bought Learn Powershell in a Month of Lunches, and I still haven’t gotten around to doing it. So this fits in nicely as one of my resolutions. Update my resume. In my very first blog post I mentioned that I hadn’t updated my resume in a very. long. time. Like an embarrassingly long time. I’m even more embarrassed to say I still haven’t. It’s not that I’m looking for another job. That’s not the point. I just think it’s a good exercise for examining where I am in my career, what I’m doing, and where I’m going. And, hey, you never know when you’re employer is going to decide to downsize. Update my wardrobe. I despise shopping. So I don’t do it very often. As a result, my wardrobe has gotten a bit tired looking and dated. Not that it was very stylish to begin with. I tend to stick with classic basics: slacks, button-down shirts, cardigans, loafers. 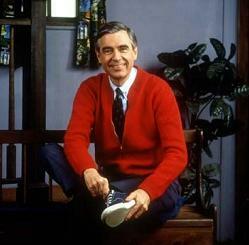 *sigh* I dress like Mr. Rogers. That’s not the image I want to project. And this will follow my month of purging nicely. Read a SQL Server book. Cover to cover. Not random chapters. Not looking things up as needed. Read it like a novel. A very geeky novel. I better pick a good one. So that’s a sampling of my monthly resolutions for 2012. Each one is definitely doable and worth doing. I’m looking forward to this. How about you? Have you made any resolutions for 2012? Great post Colleen, thanks for participating! Is there a story behind your dog’s name? He’s a German Shepherd/Rottweiler mix. I thought it a more fitting name than “Bourbon”.